It’s a big priority for me to teach my children to clean up after themselves and take care of our home. I think it’s a very important skill for them to learn, and the younger the better! Recently I was having a lot of frustration with how they were cleaning their bathrooms and I sat down to make them a Printable Kid’s Bathroom Cleaning Checklist to help keep my expectations and their cleaning in line! In case you were wondering their other day’s chores are cleaning their rooms, vacuuming their rooms, emptying trash, and cleaning our bonus room. Wipe Down Counters – We keep a container of these wipes under each bathroom sink for this purpose. Clean Mirror and Faucet – Also under the sink is a roll of paper towels and homemade window cleaner. I use a Dollar Tree basket to keep all bathroom cleaning supplies corralled under the sinks. Clean toilet bowl – I use these disposable toilet bowl cleaners to make it as sanitary as possible for them to clean the toilets. Scrub tub – this is one my older boys are just learning, we’re using these to clean the tub. I started my children cleaning their own areas very early. Even at 2 years old my children cleared their own dishes from the table and helped match socks when I was folding laundry. I believe the earlier children realize they need to contribute the better. I also raised my children in a Montessori-style environment as toddlers and preschoolers with child-sized cleaning and household items. They had child-sized brooms, rakes, garden tools and used small juice pitchers to get their own drinks as soon as they were able. When teaching them to clean at first I did not give them regular household cleaners but rather vinegar cleaners to reduce the chance they could hurt themselves (or each other) with the harsher chemicals. As they have ages we do use some “regular” cleaners now. I also taught them to wash their hands after cleaning so that they don’t get them in their mouths. We’ve used gloves in the past too. My youngest and oldest share a bathroom so they split the cleaning of that room. The youngest is 6, he is the “wiper” of the counters and toilet as well as the sweeper. My oldest does the mirrors, tub, and toilet bowl. My middle son does his entire bathroom himself. We started with wiping counters at a young age and slowly added more tasks as they got older and more responsible. We still supervise the cleaning and help as needed but they are doind 99% of the work. They are not perfect and this can still be a challenging area for us as with most families. 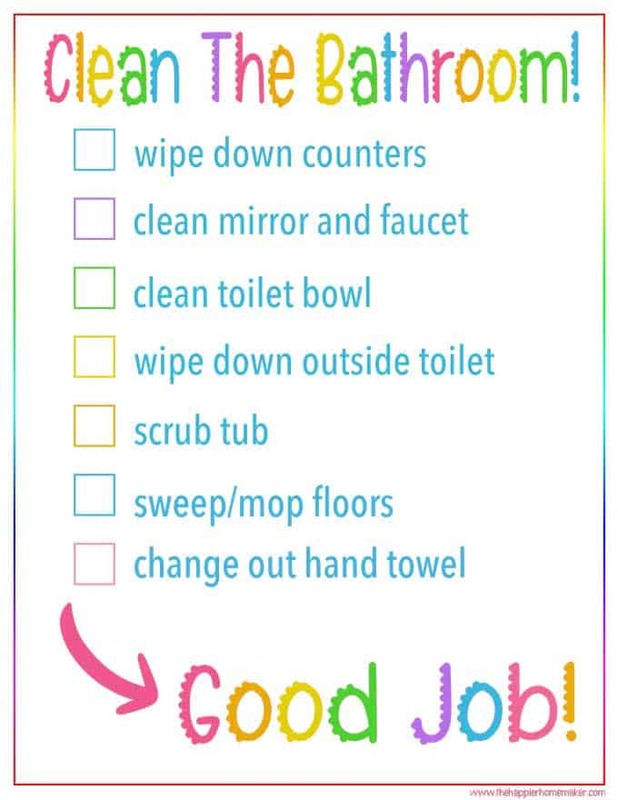 Having a printed kid’s bathroom cleaning checklist keeps everyone on the same page and keeps expectations clear. Consistency is key also! Do your children clean their own bathrooms? What age did you have them start? I love this printable! Do you have othwr ones for other rooms- kitchen, bedroom, etc? I have slacked with my kids and want to be better at cleaning and teaching them as well. Fun checklist! What fun fonts did you use? Very interesting tips, will help a lot, thanks for sharing! Awesome tips. Thank you for sharing bathroom cleaning checklist.